Hello Nashville - Free Downtown Walking Tour - Explore Music City Without Breaking the Bank! Free Downtown Walking Tour - Explore Music City Without Breaking the Bank! Our Free Guided Tours let you explore Music City without breaking the bank! 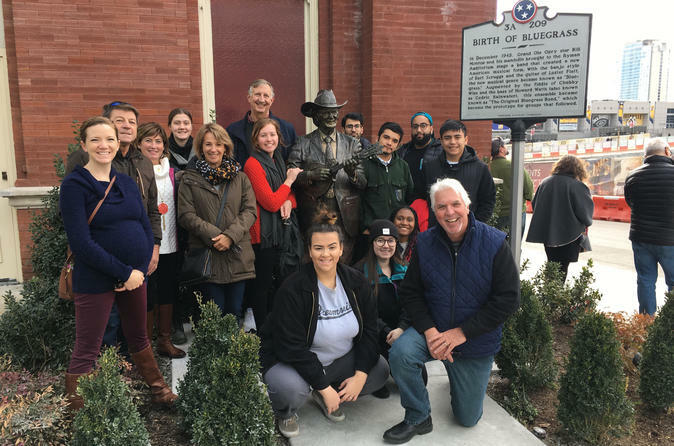 Our professionally guided tours take a leisurely stroll thru Nashville's downtown districts, while seeing and learning about the history and the music along the way. Your guide will be standing at..... Dolly's Star! Our Guided Tours are rated as a "Easy Walk." * Guides work for tips! On our Downtown Walking Tours We Visit. and Dive into Nashville's History..
121 4th Ave S Nashville TN 37203 Your local guide will be standing at..... Dolly's Star! The Historic Ryman Hall of Fame Park Andrew Jackson Chet Atkins Little Richard Star Walk Country Music Hall of Fame Bat Man R2D2 GOO GOO Alan Jackson The Preds The Bridge Symphony Center -Titans Historic 2nd Avenue Minnesota Fats Printers Alley The Art District The Hermitage Hotel Honky Tonks Tootsies Ernest Tubb Johnny Cash George Jones Nashville Sit-Ins - TN State Capital ..... Much More!